Greg Morse, Lead Operational Feedback Specialist - RSSB, looks back thirty years and considers why the lessons learned at Clapham remain just as important today. Late in November 1988, an under-trained, over-worked technician left a bare wire dangling instead of cutting it back, tying and insulating it. 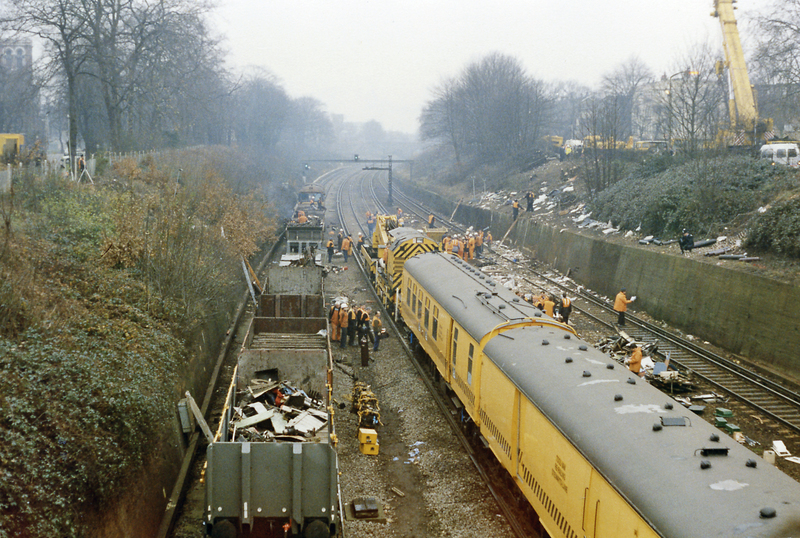 A fortnight later – on 12 December – further work jolted the wire, causing it to touch a terminal, make a connection and prevent a signal from returning to danger after the passage of a train. That morning, a crowded passenger train collided with the rear of another that had stopped at a signal just south of Clapham Junction. The leading coach then struck an empty train travelling in the opposite direction. Thirty-five people died; 484 more were injured. The resulting public inquiry, led by Anthony Hidden QC, revealed issues around fatigue, training, reorganisation, communication channels and a complacent attitude to safety. As Hidden would write: ‘the appearance of a proper regard for safety was not the reality. Working practices, supervision of staff, the testing of new works […] failed to live up to the concept of safety. They were not safe, they were the opposite’. Re-organisation had not caused this situation but failed to ‘come to grips’ with it. Regarding fatigue, the technician had undertaken constant, repetitive work and excessive levels of overtime, both of which had ‘blunted his working edge’. To be more explicit, he would’ve had one day off in the previous 13 weeks. Among the report’s many recommendations was one to ‘ensure that overtime is monitored so that no individual is working excessive levels of overtime’. This led to the development of criteria for what was considered acceptable levels of working and a process to monitor it. New processes and instructions were also introduced regarding the installation and testing of signalling works. And yet, the corporate memory exists only while we remember it, and over the Christmas and New Year period of 2016/17, we seemed to forget. At this time, extensive resignalling and track remodelling work was being carried out in and around Cardiff Central. Some of the new layout was brought into use on 29 December. At 08:37 that day, the driver of a Treherbert service noticed the points his train was about to take were not in the correct position. He stopped the train just before reaching them. The Rail Accident Investigation Branch (RAIB) would conclude that the points had been left in this ‘unsafe condition’ because they hadn’t been identified as needing to be secured by the point securing team. RAIB also felt ineffective fatigue management to be a possible underlying factor. Simon French, RAIB’s Chief Inspector, drew a clear line back to Clapham, pointing out ‘how easily things can go wrong when railway infrastructure is being upgraded and renewed,’ pointing out the importance of managing the working hours of people doing the job ‘when organising intensive periods of commissioning work’. ‘Back in 1988,’ he went on, ‘the disastrous collision at Clapham Junction happened in part because working for weeks on end without any days off was part of the culture in some areas of the railway’. The events at Cardiff showed ‘how easy it is to forget the lessons of Clapham and slip back into those habits under the time pressures of a big commissioning’. A few months later – in August 2017 – a train departed Waterloo on a green but was incorrectly routed and collided with an engineers train on the adjacent line. Luckily the driver saw the way the points were set and managed to brake, meaning the collision occurred at low speed and resulted in no injuries. A temporary wiring modification made during weekend works had not been reversed when the railway was handed back for operation on the morning of 14 August. We could quote French again here and Hidden too. In short, it’s all about understanding and managing risk. Hidden suggested British Rail (BR) had become almost blind to the risk from wrongside failures, contrasting it with its focus on signal passed at danger (SPAD) risk. BR was probably right to put proportionately more focus on SPAD risk in the late 1980s, but not to the exclusion of wrongside failures (or any other hazard, come to that). Indeed, there’d been a number of “Claphams in the making” that a greater emphasis on weak signals might have highlighted. Most worryingly, a signal at Oxted had shown green when it should not have done. A relay had been energised irregularly, a fault which would have been discovered by a wire count, but – as with Clapham three years later – no such count had been undertaken. Worse still, the resulting ‘flurry of paperwork’ provided important information but was shared with very few people and therefore did not feature in anyone’s thinking during the work at Waterloo. We all know we can increase the accuracy of our risk picture by collecting, analysing and learning from information, not just about accidents but also their precursors and the activities that prevent them. As Cardiff and Waterloo remind us, data and information – from the past and the present are only any use if we analyse results, understand what they mean and act on them - out in the operational environment and not just on paper. If you have concerns about how works are being managed and handed back, or information that could prevent incidents is not being widely shared – report it. Coincidence used exactly the same comparison in a recent essay for the IRO. Thanks for that Neil, good to know! If you have any web links you wanted to post here for your essay, others might find that useful too. Institution of rail engineers have a good take as well as the RAIB.